It seems at one time in our history everyone could tell you where they were when President Kennedy was shot. Well, presently most all of us can tell you where they were when 9/11 happened. My experience was unforgettable and enlightening. My friend Manuela and I were traveling from her home in Stuttgart, Germany through Switzerland and into Italy. We had spent the day in Monaco visiting their lovely castle, harbor, and casino daydreaming about being rich and famous. We took the train there from Italy and being the end of the day we were heading back. Near the train station we walked by a small television store where a small crowd had gathered. President Bush’s face was plastered on the front of every television in the window. One sees a President’s face on television on a daily basis but there was something strange in his expression and that of the body language of those gathered around the windows. Manuela and I walked over unable to hear what the television was saying. The ticker at the bottom of the news station on one television was thankfully in English. It stated that an airplane had crashed in to one of the twin towers. No one had suspect terrorism quite yet. Manuela and I were discussing the situation in English surrounded by Italian and French speakers as the second airplane crashed in to the tower. Interestingly enough Manuela used to work in New York and was more familiar with the towers than I was. Everyone around us began speaking to us asking if we were “Yanks” asking if we had family working in that building. Everyone outside of the US apparently visualizes our country much smaller than it actually is. I assured them I had no family in the buildings but was quickly becoming overwhelmed with the thought that hundreds of thousands of people must have surely died in these buildings and those surrounding it. The kindness of these strangers was what struck me. People wished me well and prayed that my family would be safe. In short order the towers fell and the Pennsylvania crash occurred and the word terrorism became a common word. Walking through the lobby of our small hotel the attendant gave me his condolences as though this was a personal loss to me. We only desired information in English which was hard to come by. I started longing for home to be with the people of my country despite the fact this tragedy didn’t personally impact me. I knew my mother would be worried about my safely tucked away in Italy even though she was probably in more danger than me. But, I know how my mom is. I tried to call home and the lines were blocked. If you haven’t experienced it yet the lines are quickly overwhelmed during a disaster and it is virtually impossible to get through to anyone. So, working in law enforcement I decided to call my office knowing the line would be free. I called my co-workers and told them to call my Mom to tell her I was safe. As irrational as it was it was nice to know everyone at work and home was ok too. My Mom was naturally scared to death for my safety and was relieved to get my third person message to her. In short order more information was provided and moments of silence were experienced over the radios and television and workplaces throughout Europe. 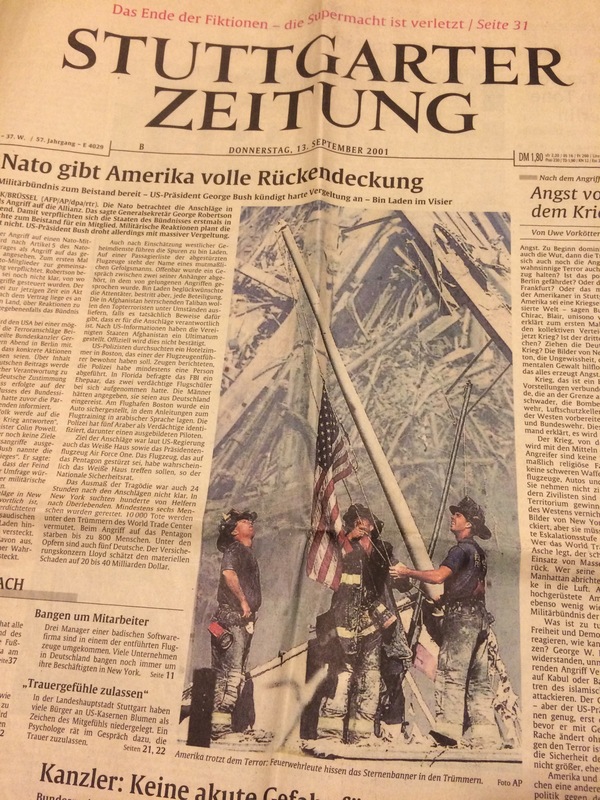 Every newspaper had every government official in every country supporting the US which was a very comforting feeling. Somehow, I knew this support would turn political and would change. But, at that moment the normal people through the countryside supported the US in our time of need and that is what I choose to remember. Time has gone by and my memories are starting to fade but I remember two things vividly. I remember driving past an American Army base near Manuela’s home in Germany seeing it covered in signs, flowers, and teddy bears in support of NY and the US which were one in the same. And I remember a popular song at the time Enya’s “Only Time” had taken on new meaning. It was a beautiful and popular song but it was played in solemn remembrance of those who died that day. Radio stations all over Europe in all the countries we drove through to get home played it over and over. My story isn’t over. I needed to get home. You may remember that flights were cancelled for days after the attacks. Domestic flights resumed shortly after but international flights left people stranded for a few days. I called the airlines offering my flight to anyone who needed to get home. The reality was I had a safe place to stay with Manuela and my job wouldn’t miss me. The airlines refused to change flights for anyone because too many people were displaced already. I would come home and I would come home on the first day international flights were again allowed. And I needed to be at the airport four hours early. I said my goodbyes to Manuela and she left me in the Stuttgart airport where my flight was promptly cancelled. I was placed on another flight hours later to Frankfurt where I missed my connecting flight because the airports were literally nuts full of stressed out airline employees, and scared and smelly people who were living in the airport and hadn’t showered for days. It was in the Frankfurt airport where I met the Ugly Americans with whom I will never forget. Naturally everyone was exhausted, displaced, agitated, and scared. Understand people were still afraid their plane might be high jacked in the days following the attacks. Additional security points were added at every step of the process and I was currently standing in a line of at least 500 people. I was between a lovely young Indian couple with an infant in traditional Indian clothing and four older white people from Georgia who had been golfing in Germany. We had been standing in this line for what felt like hours and I couldn’t help but notice the frightful faces of the Indians ahead of me. I had observed their British accent and had even noticed their Great Britain Visas. I wondered what it must be like for them at that moment. Many people were looking at them suspiciously. The Sari and traditional clothing the man was wearing clearly identified them as having Indian decent to me. But, behind me one of the Georgian men loudly declared, “I hope that Rag Head isn’t going to blow up OUR flight.” The Indian woman grasped her infant tighter and the man looked stalwartly ahead. I turned around and gave them the famous hairy eyeball not believing my ears. The man’s wife agreed with his statement and continued to make statements frankly I don’t think I can come to type out loud. Mount Vesuvius erupted. I turned to the Georgian people and pointed my finger at them stating that they were ugly Americans, I was embarrassed to call myself an American if that was what we were thinking after such a recent tragedy, told them they were uneducated and bigots for not recognizing the difference between an Indian couple and those that perpetrated this tragedy, the young woman had a baby for God’s sake, and so on and so forth. Sadly, when I turned around the couple was gone clearly wanting nothing of the confrontation or my outburst. Security wasn’t particularly pleased with my raising my voice or a bunch of Southern responses to my outburst of, “Well I never!” (Say it like Scarlet O’Hara.) I had had about enough of these people and gave up my place in line feeling sad, angry, and confused. From there I flew to Chicago where I spent the night on the floor of the airport Gate with a lovely elderly woman from Land Park who was afraid to be alone with all of the “business going on” as she put it. After another eight hours we finally found a flight home to Sacramento. As every flight landed during this ordeal people would clap. It took me nearly 24 hours to get home. The memories of people patting the Yank on the back because of their perceived loss of my family, the moments of silence throughout Europe, the teddy bears in front of the American Army base, Enya’s song, the racist Georgians, the frightened Indian couple I tried to stand up for, images of firemen holding up the American flag on top of “the pile” on the cover of every newspaper, and the sweet lady from Land Park will forever be etched in my mind. It was just random that I was on a trip when all of this happened. But, I found it to be an enlightening place to be for such an event. And as politics and ugliness unfolded over coming years I choose to remember the sentiments of the normal Europeans I came in to contact with because those are what matter to me. Happy Patriot’s Day. (It seems a strange sentiment to wish but wish it I will.) I hope you can remember where you were on September 11th, 2001 and never forget those that sacrificed their lives and all of those across the world who supported them and still do. Weeping, Wow.————-Thank the Universe (or whatever powers that be) there are more knowledgeable and thoughtful people in America, and in the world, than there are these Ugly, Ignorant Americans. and . . . I remember. I was driving to work and I was 6 months pregnant with Chris, and when I heard on the radio what happened, I tried to convince myself it was a mistake, and think I even said it out loud over and over again, “This has got to be a mistake”, all along crying, knowing it wasn’t. Thank you for writing this Jenny. Say it like it is Jenny, say it like it is! I think our world has grown up behind this, it has evolved over time into a more understanding and accepting planet ( in most area’s) . I would like to see more compassion and respect (for each other and life) we only have one human species on this planet and we should take note, that it may come a time when we all will have to put aside our differences to protect this beautiful planet we call Earth! I am left with goosebumps, a lump in my throat and teary. Most of al l want to stand up and cheer that you confronted the bigotry of the ‘ugly’ Americans. Thank you for standing up for what is right. Thank you. It was an interesting place to be and to experience it for sure. I was at work. Someone bought a tv in. The room quickly filled up. No one spoke. PS: may I share it in twitter? Oh thanks. It was a sad confusing time and everyone was very tired. What those people said was so bad and it was so embarrassing to me as another American. Thanks for the comment. I am glad you had the courage to stand up to those obnoxious Americans. I have often been so embarrassed by other Americans when I have been traveling. I’ve never had the courage to tell them why their behavior is so offensive, however. Thanks for the wonderful comment. It’s hard for me to write terribly personal stuff but I felt compelled to on this one. Have a great weekend. I will always remember where I was, and how I felt. Working (Amsterdam). E-mailing with a NY colleague who could see what was happening, and was very scared. It felt completely unreal. Well done you for standing up for the Indian couple. I probably would have done something similar, can’t stand those type of people, too ignorant for words and unbelievably cruel. Never mind the couple walked away, you still gave them something to carry with them. Staying silent, saying nothing when something is blatantly wrong is awful. Well done you, really. Thanks for stopping in. Good to have you! My pleasure – and likewise! Excellent Jenny and well said. I remember that day well. Watching TV when the 2nd plane hit, getting ready to leave for work. I was working for a dentist at the time, and when we all arrived, agreed we could not focus on our patients. I started calling to reschedule their appointments, and all but one agreed to a new date. The man stated it was only a cleaning, come on people!! I explained we were all grieving and gave him a new date. Later he switched offices, we were glad. So many years have flown by, but I will never forget that terrible day, and the worry I felt for our son who worked in Manhattan. We travelled over from South Africa to see him as soon as we were able to get on a flight. I was so grateful that he was okay, and just needed to hug him. Wonderful, thank you. Will check it out. I was standing in the middle of the Community Room in my apartment building, with my mouth hanging, as I recall…. I didn’t see the first tower go down but I did the second. Yikes. That must have been terrifying. It is interesting how time freezes when you hear of news like “Kennedy’s been shot” or “planes flew into the twin towers.” My sister called to tell me, from another country…I did not believe her. We were scheduled for a trip to Turkey 2 days later….we cancelled of course. So well written, such a shocking day. Thank you! It was an interesting place to be during such a tough time. OK…the link opened it. And…Wow. Yeah, such a tragedy, such nonsense. The beginning of the end of the good old days. And thank god for the good people of the world. I remember where I was when Kennedy died, and where I was when the Towers fell. And I think I got that same sinking feeling in my gut. I’m not sure I would be able to write a post like this. So thanks for doing it!! Thank you. I felt good about this one. Since then there have been others that I haven’t been able to figure out. A lot lately as a matter of fact. Happy travels to you. Hope you have something exciting planned in the near future. Did you actually use the word “plan” relating to me? Ha. Good point. Well I hope something comes out of nowhere to inspire you to go to some random place soon. Lol.